For your convenience to contact Hertz We have provided all possible information of Hertz. You can contact Hertz on the given phone number +1 (201) 307-2000, +1 800-654-3001 , +1 800-654-4173. To know the address location of Hertz it is also presented here 225 Brae Boulevard, Park Ridge, New Jersey 07656, United States. Contact them by sending email to Hertz you will find an email address here executivescustomerservice@hertz.com. To know more about Hertz, go to their website www.hertz.com and collect all possible information from there. You can contact them from their website also. If you have any comment to post or you want to register a complaint against Hertz, you are advised to go to the below box and post your view there. +1 (201) 307-2000, +1 800-654-3001 , +1 800-654-4173. The Hertz Corporation is the United States based pubic company that operates different business divisions namely- Hertz Rent a Car, Hertz Local Edition, Hertz Equipment Rental, Hertz Car Sales and Hertz Truck & Van Rental. The company started its business in the year 1918 and is headquartered in Park Ridge, New Jersey, United States. Hertz Corporation is the parent company of Donlen Corporation, a fleet management company that offers maintenance and outsourcing services for corporate vehicle fleets. The company serves customers with Three brand names such as, Hertz, Dollar and Thrifty and has a network of nearly 10,300 corporate, licensee and franchisee locations. It is also recorded on the New York Stock Exchange with the sign HTZ since 25th of April 1997. Hertz is one of the leading airport car rental brands at around 110 principal airports in Europe. It provides its car rental and leasing services in more than 145 countries around the world. Among them few are Australia, Netherlands, Italy, United States, United Arab Emirates, Spain, New Zealand, Netherlands, Saudi Arabia, Guatemala and more. The Hertz Corporation is one of the largest providers of car rental services in the United States. The Hertz Corporation was incorporated by Walter L. Jacobs who started the first car rental business in the United States and it is a division of Hertz Global Holdings Inc. It also launched on-board navigation system under the name NeverLost in the year 1995 that helps the customers to reach any destination through turn-by-turn driving directions. Its official website www.hertz.com was released in the year 1997 for the people to provide access for visual vehicle guide, company's latest information and info about Hertz services and many more. The company's Europe Service Center helps to manage phone calls from France, Ireland, Switzerland, Italy, the United Kingdom and many others regarding the reservations. The company also signed agreement with Toyota in 1999 to deliver the car rental service at nearly 1,000 locations in Japan. It started its premium car rental service in the month of June 2001 with a fleet of luxury vehicles like, Jaguar, Land Rover, Audi, Cadillac, Hummer, Volvo and many others. Hertz began Sirius Satellite Radio service in its around 20,000 vehicles since December 2002 in the United States and broadcasts around 66 channels for the customers. It launched new military hiring portal in May, 2012 that provides employment opportunities to the veterans and their family members through its different subsidiaries. In 2012, the company operated more than 490,700 cars as a part of its rental fleet in the United Sates, and on the other hand, around 177,900 cars were internationally operated. The Hertz Corporation delivers a broad variety of products and services to the customers that are vary from different countries. Its products and services include, Hertz Mobile Wi-Fi, Hertz Fun Collection, Hertz Prestige Collection, Ski Racks & Chains, Hertz Leasing Program, Rental Car Refueling Options and many others. The customers can also make car reservations online and also cancel them when required through its official website. The company launched mobile application for Apple iPhone, Android, Symbian (Nokia) and Blackberry devices to provide faster Booking access, receive special offers and many other benefits. The customers are required to join its Hertz Gold Plus Reward program to get rewarded on their every reservation. The Hertz Corporation has its corporate headquarters at 225 Brae Boulevard, Park Ridge, New Jersey 07656, United States. The company provides contact number +1 (201) 307-2000 to contact directly at customers headquarters. The customers can get information regarding reservations or routes by calling at customer service numbers +1 800-654-3001 and +1 800-654-4173. The company's e-mail address is executivescustomerservice@hertz.com for receiving the customers queries and helps to solve them. 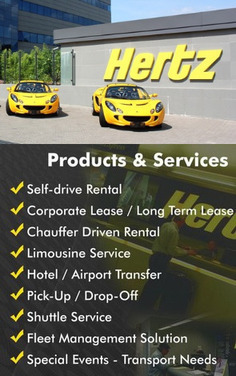 The Hertz Corporation provides its official website www.hertz.com to provide access of many services online from anywhere. Search in google Hertz with the name Google Plus, Facebook, Twitter, linkidin Pages and you will find more information on these pages. Search in google like Hertz Google Plus Page. When you call to Hertz, ask for toll free number to enjoy charge free calling. At the first step When you call to Hertz please do not forget to tell them that you have found their contact number on findbusinessaddress.com.